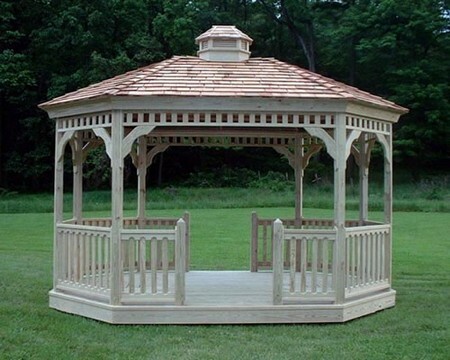 If you’re looking for a challenge, figuring out how to build a gazebo will provide just that. Remember to use only hardware corrosion-resistant and weather-resistant lumber. 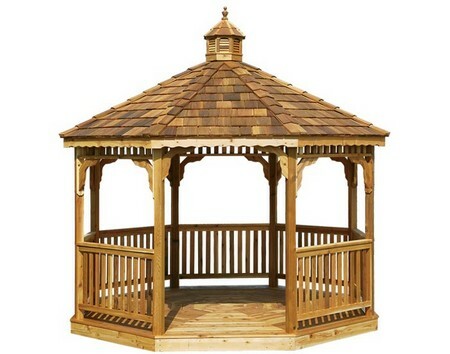 Your gazebo may also need to comply with local building codes construction begins. Dig down for the gazebo’s concrete footings after staking out its outline. Footing holes should be evenly spaced, at least 3 feet deep, 1 foot across, and slightly wider at the bottom. Each hole should be filled with several inches of compressed gravel first. Squared frames are made to contain the quick-drying cement above-ground for each footing and removed after it sets. Adjustable post anchors are used when learning how to build a gazebo. Cement is poured for the center footing first and a 6″ x 6″ wooden nailing block 6 inches long set into its center with at least 4 inches remaining above the cement. Perimeter footings are poured and anchor bolts set one by one. Ensure each anchor bolt is plumb and level before the cement sets completely. The anchors are assembled square to the center footing with 22.5-degree angles between posts after the cement sets. Notches 6 inches deep and 1-inch wide are cut into each 4″ x 4″ post to attach the rafters. Posts should be attached to the footings at their anchors and double-beveled to 22.5-degree angles 5.5 inches from the base. The posts are offset to the gazebo’s center so that rim joists can be attached. Attach posts to footings at each anchor. Offset the posts toward the gazebo’s center. The beveled edges must clear the sides of the anchor so that the rim joists can be attached. Joist hangers are attached to posts at even heights. The center nailing block is trimmed to allow the 2″ x 6″ spanning joist, spanning the gazebo’s width between opposite posts, to be toe-nailed to it. 2″ x 6″ lumber headers are trimmed to opposite 22.5-degree angles and attached to the joists where they span over 24 inches. 2″ x 6″ redwood rim joists are trimmed at opposite 22.5-degree angles and attached outside the posts. The remaining joists are trimmed to span the rim joists and headers and attached with joist hangers. Pressure-treated lumber decking is installed, beginning at the rim joist. The first row of deck boards should be notched to fit around the posts and their ends trimmed to 22.5-degree angles to join the deck joists’ centers. A 6″ x 6″ kingpost, 7 inches long, can be bought at a hardware store. To this, 16 trimmed 2″ x 6″ rafter pieces are joined. Pilot holes are drilled though the rafters and posts before they are secured with 4-inch bolts. Common roofing options are redwood slat and shingles over spaced or plywood sheathing. Metal flashing is attached to the roof peak before the finial that prevents water damage to the kingpost and rafter joints is toe-nailed on. Joining edges and exposed nail heads should be caulked before the project is considered complete.